1) Stir-fried vegetables (broccoli, carrots, snap peas, mushrooms) with chicken. I really liked the color of this dish. I kept to the common broccoli and carrots because my American friends may not be too adventurous when it came to their vegetables. 2) Tomyam soup with nappa cabbage, carrots, onions, tofu and chicken. I didn’t have time to take a picture of the soup so here is a recycled old photo of a tomyam soup that I made ages ago. This isn’t a safe dish as it may be too spicy, but at the same time it shouldn’t be totally new since there are some Thai restaurants around. This soup added the “hot, spicy, sour” factor to the meal. I had to include a child-friendly item because a friend was bringing her 9-year-old daughter. But the girl would rather play with my Lego than eat. 4) Steam tofu with green onions and oyster sauce. This photo was taken at another dinner that I hosted 2-3 months ago. I made a tofu theme dinner that day (i.e., steam tofu, stir-fry tofu puff with mushroom, and tomyam soup with turnip tops and texturized vegetable protein TVP-a soybean product). Anyway, the steam tofu was served the same way, with green onions, garlic oil and oyster sauce. This was the “fear factor” dish since tofu is not common in this area and some people are afraid of the white cheese-looking item. And finally, we had carrot cake (that I baked) and eclairs (that someone brought) for dessert. I’ve had this office chair since May 2006. A student was moving out and I bought it from her for $10. It was alright initially but soon the cushion wore off. It also never supported my back well. Lately, my back has been feeling strained and tired. Time for a new chair but good office chairs are not cheap. 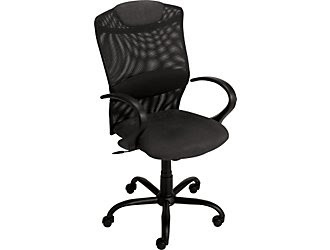 I was attracted to this Staples Vocazo (mesh back with lumbar support), but it costs $99. Even with the $25 discount coupon that I received from Staples, it’s still more than what I’m willing to pay. 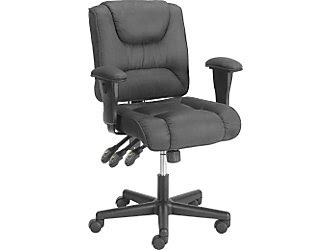 Then this week, the Staples store offered this nice microfiber task chair called Mullen for $69 (original price $129). The cushion looks so thick and comfy. But still too expensive. 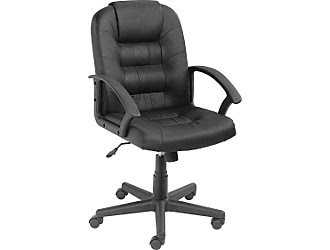 There’s also this Staples Manilo leather manager chair for $39. But the reviews were really bad for this particular chair. I decided my back comfort will have to wait a little longer till I’m in a better financial position. Anyway I finally got verbal permission from the Salvation Army thrift store (YAY!! ), so now I could start working on my research. Today, I went to the thrift store to get some research work done and guess what I saw? This nice used office chair for $16! The tag said that it has been sanitized but I actually saw a big piece of cracker/biscuit in one of the crevices. Even so, $16 is a good deal. So now I am sitting comfortably in my “new” office chair….aahhhh…. It’s been really cold the past few days. The temperature dropped to -17C but because of the windchill, it felt like -24C. 3) since my bed is near the heater, I’m afraid my blanket might fall on the heater and catch fire. But because the heater is off, it gets really cold in the room especially when the temperature is -17C outside. c) a polyester fiber-filled comforter in a flannel comforter cover (3 layers). By the way, I was also wearing three t-shirts. Whenever it is cold outside, water vapor will condense on the cold window inside the apartment…like the water droplets on the outside of an ice-cold glass of water. The past two mornings when I woke up, I found ice on the window….not ice outside the apartment but ice on the window inside my room! Thankfully, the deep freeze is coming to an end. The first “major” snow of 2009 here. It was nice and warm in the apartment but I decided to go out for a very short walk anyway. Took some photos, which was not easy to do with snow flakes falling everywhere. I didn’t want to totally lose the fuzzy feeling for snow. It’s nice for a short while then reality kicks in and I have to dig out my car and walk around in slushy dirty roads. I think the most magical moment is when thick fluffy snow is falling and you’re traveling in a car. The snowflakes look like they are suspended in mid air, and then your car hits them. I started this Max in the Adirondacks cross-stitch project in 2004. The first summer that I was home in 2004, I took this back and was working on it (off and on) for three months. I like Max in the Adirondacks because the cat and fishing gears remind me of my dad. At times I wondered why I chose this extremely elaborate and difficult piece. It seems it’ll never get done. After that summer, when things got busy at school, I put it aside and sort of forgot about it. I pulled it out several days ago and started to work on it again. I guess the frustration of not being able to get things done for my dissertation makes me want to do plug away at something, anything, just to see something being completed. During my last two trips to visit the Cheah family, I’ve been exposed to some good dogsitting experiences. Since I’m staying in a no-animals allowed student housing, it’s nice to hangout with other people’s pets once in a while. When I found out that a friend is looking for someone to co-dog-plus-house-sit with her. Her advisor will be away and needed someone to take care of the two dogs but my friend couldn’t stay the entire duration, so I agreed to help out for a few days. I thought it would be a nice de-stressing vacation, in addition, the prof’s house is considerably nearer to the Korean grocery store and the nice chinese buffet. For several days prior to my dogsitting commitment, I thought I would not be able to make it because my car was in the garage. Thankfully the car was ready on time. On Sunday (Dec 28, 08), I made the almost an hour drive to the prof’s house, which was in the middle of nowhere. After checking in on the dogs, I drove to the chinese buffet for lunch. The food was good, unfortunately they didn’t serve the black bean mussels and cheese-baked mussels, which were the two items I was really looking forward to. The dogs, Jack, the black Labrador, and Harry, the white spotted dog, were quite adorable. They were always excited to see me whenever I came back to the house. Honestly, I’ve never had anyone look so excited to see me every time I walked into the house. I guess that’s why people have pet dogs. Harry is also a very good companion when I’m either watching TV or doing some reading. Unfortunately, he was too used to always being with a human person. I sort of decided that I didn’t want the dogs in the bedroom, so I locked them out of the room that I slept in. They had the rest of the big house to themselves but Harry was not happy with that arrangement. He whined and barked, off and on, throughout the two nights I was there! I could have let the dogs in but I didn’t want to give in to them. If you watch the movie Marley and Me, you’ll see the miserable sleep I had for those two nights. After a sleepless night, I had to wake up at around 6am to let the dogs out! Crazy dog schedule. One more thing, I couldn’t get online while I was there. That was the biggest routine buster of all. Fortunately, there was a treadmill in the house, so I was able to squeeze in a run each evening. On the last day, I went for another round of chinese buffet. This time they had the black bean mussels but the mussels were small. I also bought a carload full of groceries. So the money I earned from dogsitting all went into the groceries and buffet lunches.